“Mama, it smells skunky here,” the 7-year-old me said, crinkling my nose, on my first walk down Venice Beach. “Yes. Yes, it does,” my mother said, smiling, quickly moving me along. Now, after more than eight years and a few more trips, I know that’s not what it was. Not at all. We arrived by plane, flying early in the morning from Boston’s Logan Airport, in time for my bonus dad, Billy, to catch a different kind of ride—out on the waters of the Pacific Ocean. He was crewing that week aboard racing boat Elixir, a Juneau 40 competing in the Newport-Ensenada race. My Nana, finishing her work week, was arriving the next day. While waiting for them, my mom and I stopped in at Trim on Abbot Kinney Boulevard, “the coolest block in America,” which is a creative mix of organic, vegan restaurants, funky high-end shops and wellness-focused body, hair and skincare centers. As I admired the blue feathers woven into my hair, I had never been more excited. We hit the LA Zoo to show them to the flamingoes, all as vibrant as my hair. Between that, getting my hair done in a real California salon, seeing the Hollywood sign, and bringing Julie, my favorite doll, to the American Girl Store at The Grove, I couldn’t have asked for anything more. Once the family was all together again, we dashed to Disneyland. This was my second trip here, but I was only 2 the first time. This time I wanted to remember everything. We stayed all day, from opening gate to magical fireworks. I was so tired, but I had to go on one last ride with Nana, the Finding Nemo Submarine Voyage. At 7, I thought it was so cool, pretending to be under water. During my next visit, April break of eighth grade, my dad and I took the ride. (Actually, we took many rides.) The first was the train from San Diego to Anaheim. Now tall enough and four years older, I’d finally built up the courage to go on Space Mountain. I was so proud of myself. My dad isn’t big on rides, so it took a lot of convincing to get him to go on with me, but he did it. We ended up having the best time. I had never been to San Diego, I had only been to Los Angeles, so I was looking forward to exploring a new part of this huge state. The first night, we went into Old Town, which was beautiful. We had dinner at Barra Barra Saloon, which I say is the best restaurant there. I also found this little weird place on Calhoun Street, the Old Town House of Jerky and Root Beer, where I got a root beer float. I had never had one before, so to have my first in California was pretty exciting. We found restaurants we wanted to try, we went into all the small shops, and we even found a street market. We don’t have anything like that at home in Boston so it was an all-new experience for me. On our last day, we went back to all the shops we walked by the first day. I bought a lot of souvenirs, and we went back to Barra Barra. After our early dinner, I got another root beer float, because it turns out, they’re amazing. About two years later, my dad and I planned another trip. Most vacations, we go to Florida, but we wanted to go somewhere new. We began talking about our previous trip to California, and that was when we decided to go again. This time, we stayed in Oceanside. We stayed at Oceanside Marina Suites. The hotel was gorgeous, and our suite had two bedrooms, a full kitchen, living room with a fireplace, two bathrooms and a huge balcony over the water. The first night we were there, we walked around the street fair in Oceanside. We looked through all the shops, and I tried beignets for the first time. They were small squares of fried dough covered with powdered sugar—so sweet. Friday morning, we got in the car and started to make our way toward Los Angeles. We were going to the Dodgers game at 7 that night, but before that, I wanted to see some of the beaches. We took the Pacific Coast Highway to LA and stopped along the coast. My favorite by far was Long Beach. The streets of Long Beach were filled with shops and restaurants. I did some shopping and found a smoothie shop, where I got an acai bowl. We got tickets to my first Dodgers game, although I have been to many baseball games, this one was especially cool. I tasted my first Dodger dog, which is very popularly known. Many say it is the best hot dog, but I personally disagree, I think Fenway Franks win by far. Although it wasn’t my favorite, I understand why people love it. It was very good. The next few days, we went to Palm Springs. We got up early and started driving. 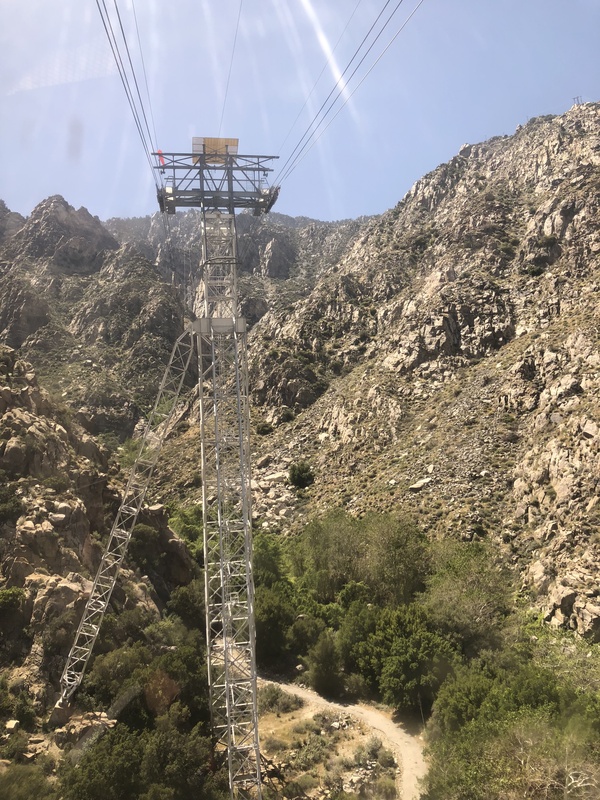 It was a beautiful 80-degree day, so we took a ride in the world’s largest rotating tram car. Up two and a half miles to the summit of San Jacinto mountain, it was only 45 degrees when we got to the top. It was so cold. Then we walked around El Paseo. El Paseo had a lot of shops, but nothing I really loved. I got a coffee from the Coffee Bean & Tea Leaf, which is my favorite coffee shop out west. I went into Anthropologie, Lululemon and Saks Fifth Avenue. On the way back to the hotel we stopped at Dave and Buster’s for some silly fun—dinner and games in the arcade. Although we have Dave and Buster’s at home, it was still an enjoyable thing to do. 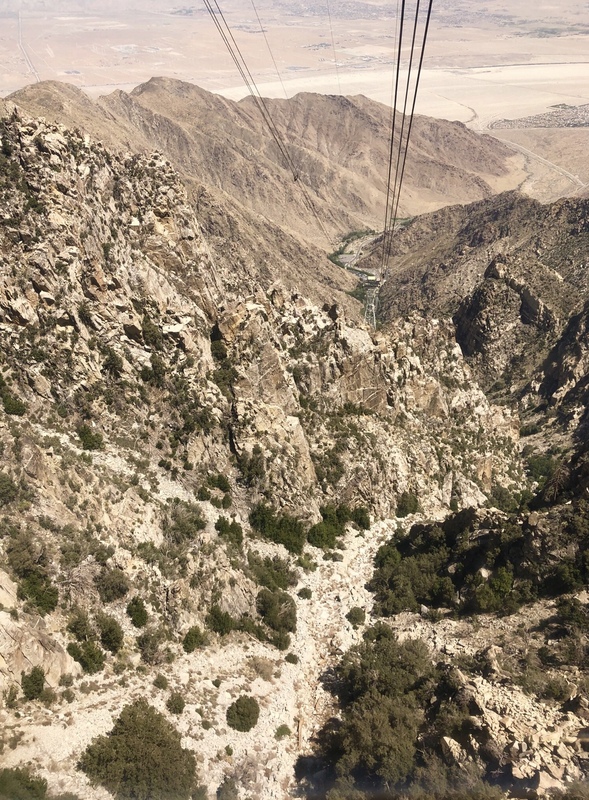 to the view of the valley below us, San Jacinto Mountain brought the extremes of California together. Soon enough, our trip was almost over. That night, we went to the Padres game. The Padres game was very fun. We got nachos and enjoyed the game but it was a bit chilly (around 60 degrees), so we didn’t end up staying for last inning. We went to bed early to get ready for our last day. The next morning, we drove back to Palm Springs but this time we went to The Desert Hills Outlets, with more than 150 stores. We stayed there all day and I did a lot of shopping. We began the drive to LAX around 4 p.m., for our flight at 9. We had such an amazing trip, I was sad to come home. In a few weeks, I’m going back to California—this time with Mom, Nana and Billy again, and for his first time, Finn. He’s very excited to go to Disneyland, and so am I. But what could possibly make going to California for a fifth time special? After Anaheim, we’re driving from California through the Mojave Desert, to Las Vegas. Another first to cross off my life list. Maura Collins Starr is a journalist-in-training, competitive sailor, photographer and aspiring YouTube star. She has already been to six countries and has crossed nearly 50 cities off her life list. What a great California “best of” list! One of my favorite states to explore, and your article makes me want to move another visit to the top of my life list. Well done! Next Are you making the grade?